One of my favorite Julia Child quotes is: a party without cake is just a meeting. I LOVE cake. Layer cake, cheesecake, icebox cake, snack cake, upside down cake, cake balls. Cake for breakfast, cake for dessert, cake by the ocean. I always associate cake with celebrations (I make my own birthday cake each year) because I think it just makes any day more joyful. 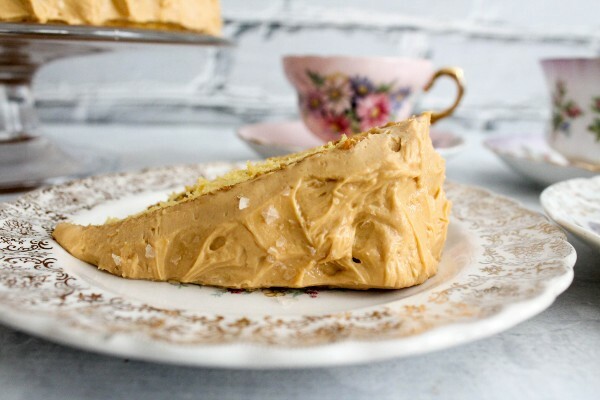 And this one – this soft, spongey, olive oil layer cake, with a thick dulce de leche filling, a luscious cream cheese frosting, finished with a sprinkling of flaky, smokey sea salt – is just incredible. The first time I made this cake was a couple of months ago, when my friend Aimee hosted a small dinner party at her house. Aimee makes The Best Mint Oreo Brownies and that night she made these Pretzel-crusted Chocolate-dipped Beer Caramels, among many other delicious things. Dan made Plaintain Kale and Pork Mac and Cheese nd in my opinion, he is the king of mac and cheese. As always I offered to bring dessert. Party = dessert = cake. And that was when Olive Oil Dulce de Leche Cake was born. I didn’t get to take any pictures that night, so I decided to make this cake again for the blog. Not for a party, not for a birthday, just a regular Saturday morning where I’m FaceTime-ing with my parents, and eating slices of cake for breakfast. The best kind of Saturday. This time, I decided to use cake mix for my cake. I make a lot of cakes from scratch, but I still always keep a box of cake mix in my pantry. You know, for cake emergencies :) For this recipe, I used Duncan Hines Classic Yellow Cake Mix. (This is NOT a sponsored post, I’m just a really big fan). 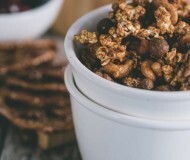 Nothing beats it for convenience and consistency! I also decided to swap out the vegetable oil that most boxed cake mix calls for, and instead use olive oil. 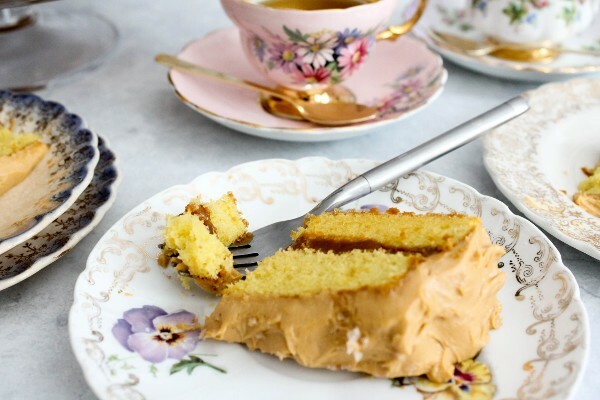 The result was a soft and lightly sweet cake, fragrant and tender, that pairs perfectly with the decadent dulce de leche. The cake looks fancy, but it is sooooo easy to make. 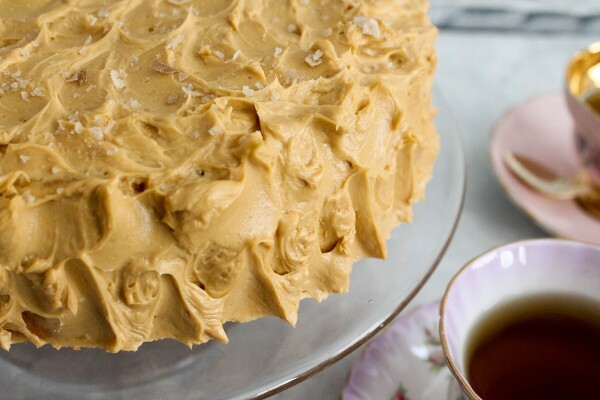 I used cake mix with olive oil, jarred dulce de leche (I bought mine from Trader Joe’s) for the filling, and for the frosting, I just whipped together a box of cream cheese, a stick of butter, and another jar of dulce de leche. Then let it rain smoked sea salt. The cake was perfect with tea, it was perfect as a late night snack, and even my boyfriend Matt (who still claims that he doesn’t have a sweet tooth) ate a couple of slices for breakfast with glee. Make this cake for your next meeting/party/weekend/Cinco de Mayo celebration/Mother’s Day/Game of Thrones viewing. I guarantee it will make you happy! Make the cake. Spray 2 9-inch pans with olive oil spray and dust with flour. In a large mixing bowl, combine the cake mix, water, eggs, and olive oil. Mix until combined. Pour the batter into the prepared baking pans and bake for 25 minutes. Set aside and let cool completely before frosting. I suggest making the cake a few hours or a day ahead, and freezing for an hour or so (make sure you wrap it in plastic wrap before freezing or refrigerating). This will make it easier to slice off the domed tops so you'll have a completely flat surface to work with for the cake layers. Make the frosting. Combine dulce de leche, cream cheese and butter. Mix until smooth and well combined. Assemble the cake. Slice off any domed tops to have a flat/even surface on both sides of each cake layer. 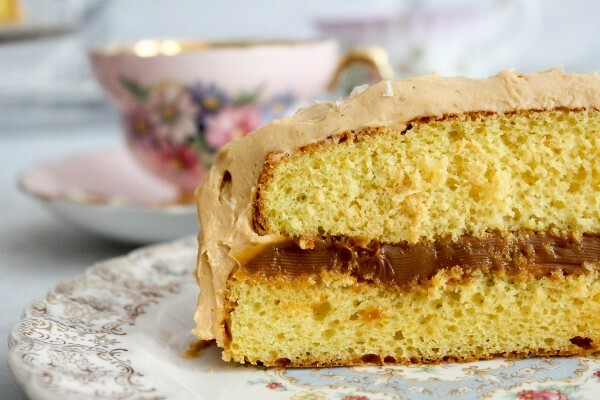 Stack layers on top of each other, with the dulce de leche filling in the middle. Frost the top and sides of cake. I created swirls on the frosting using the back of a teaspoon. Sprinkle smoked sea salt on top of cake. Enjoy! 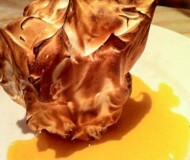 Want another dessert idea for Cinco de Mayo? How about Tres Leches Ice Cream? 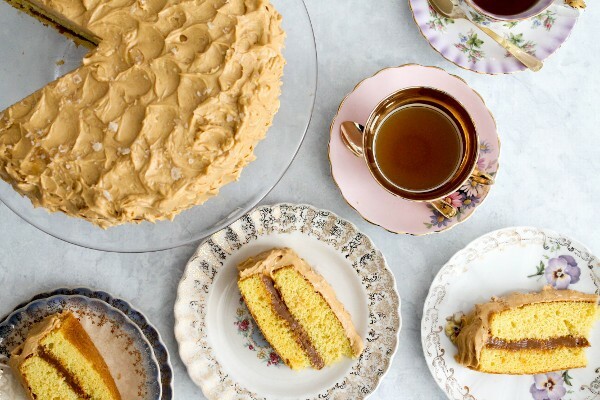 Want more dulce de leche recipes? 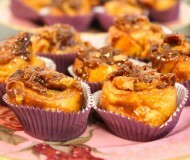 I have plenty, including Dulce de Leche Popcorn, No Bake Dulce de Leche Cheesecake, Salted Dulce de Leche Brownies. Hope your week is filled with cake! one of the girls at work brought in a similar cake the other day. so delicious. yours is way prettier though, haha! that’s a great quote and this is a great cake! 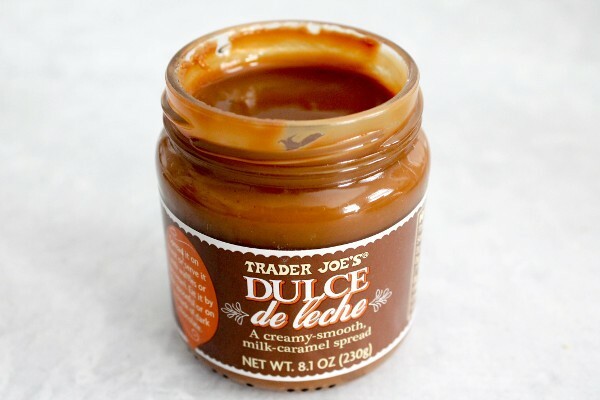 dulce de leche is one of my serious weaknesses, especially incorporated into a cake or cupcakes. bravo! That cake looks super delicious! I love your tea cups and I can’t believe I’ve never heard that Julia Child quote before.